I would like to take this opportunity to thank you for your confidence in Dutch Natural Healing. You enable us to grow in a healthy way and that way we are able to provide you with new and top quality products. Many people count on us and we accomplish this every day. Being in good health and backed up by a close-knit team we are fortunate to be in the position to help those less fortunate in terms of health. And to help them where we can. Increasing demand for CBD has resulted in an increased range of products and brands. The quality of these products and suppliers is by no means always clear and we generally see the reputation of CBD products taking a downward turn. This is regrettable and it worries us. In contrast, we have been receiving messages from our customers all over the world, on an almost daily basis, telling us about the ways our products contribute to their health and wellbeing. Dutch Natural Healing is a tower of strength in the tangle of CBD brands. All of our customers can always count on honest, reliable and high-quality product. We think it is very important to receive feedback from our customers. We are very interested in hearing what you think about us and our products! So if you happen to have a moment to spare, please do let us know the extent to which our product works for you. We are happy to inform you that we have an interesting addition to our Dutch Natural Healing range. 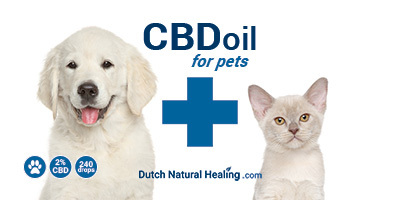 Through our years of experience with CBD Olie for people, we know that our oil is often given to pets as well. The effect our CBD Oil has on sick pets is overwhelming. Since we can imagine that not every dog or cat can appreciate the taste of our regular oil, we decided to produce an oil based on pure salmon oil. Dogs and cats usually love it, so that makes the administration of the CBD Oil far easier and much more enjoyable for the animal. We have adjusted the CBD percentage to 2%, and we recommend giving one drop for every 5 kg of body weight each time you administer a dose. from sleeplessness, 15% to 20% regularly suffer from sleeplessness lasting months at a time, and 10% of people suffer structurally from sleeplessness. During our search for healthy and effective alternatives for traditional medicines, we decided to develop a plant-based animo acid sedative that is healthy and non-addictive. We have now reached the trial stage and are busy with a test group. De current formula ensures rest and a pleasant feeling followed by improved and deeper sleep.